Dietary fiber – what is it? Dietary fiber (or dietary fiber) is a group of plant compounds that are not digested by the digestive tract. Human digestive enzymes are not able to break them down. Thus, dietary fiber goes to the large intestine, where it is partially broken down by intestinal microorganisms. resistant starch (formed in cooked and chilled starchy products, eg potatoes, pasta). Dietary fiber is found primarily in the cell walls of vegetables, fruits and cereals. Its quantity and composition depend on the plant species and the part from which they come (seeds, fruits, tubers). This type of dietary fiber does not digest and does not dissolve in water. Fiber insoluble through mechanical irritation of the intestinal walls stimulates intestinal peristalsis. This fraction absorbs water, which increases the volume of the food content, and you feel more full. The soluble dietary fiber, as its name suggests, dissolves in water forming a type of gel in the digestive tract. This gel protects the intestinal epithelium and stimulates the growth of the positive intestinal microflora. 1. Fiber regulates blood sugar. Fiber has a positive effect on carbohydrate metabolism by lowering serum glucose. This is done directly by reducing the absorption of sugars in the gastrointestinal tract and indirectly via the hormonal route. Fiber reduces insulin secretion and increases tissue sensitivity to insulin, thus preventing diabetes. Fiber is responsible for the quick satiety that appears after a meal resulting from the filling of the stomach. Fiber itself is not digested, but when binding water swells in the stomach and fills it much faster than other nutrients. Because fiber is not digestible, it stays much longer in the stomach, so you can reduce the frequency of meals consumed. Fiber improves lipid metabolism by lowering total cholesterol and triglycerides. Swollen fiber travels from the stomach to the intestines, where it stimulates peristalsis and the process of digestion. Fiber regulates the rhythm of bowel movements and prevents constipation. Swelling in the gastrointestinal tract, it binds many toxins, heavy metals and harmful metabolic products. This action has been scientifically proven – fiber prevents the formation of tumors of the digestive system. Dietary fiber supports slimming. The effect of fiber results from all the above functions. Fiber rich food is low in calories and at the same time allows you to eat quickly. The source of dietary fiber is, above all, vegetables and fruits. 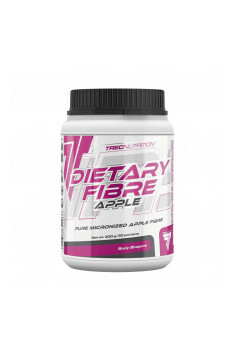 Fiber supports metabolism, facilitates fat burning and regulates the sugar economy. Additionally, by cleansing, it improves the appearance of the skin, hair and nails. However, according to research, the average European consumes only 20% of the recommended daily intake of fiber. If you are struggling with persistent hunger or want to help in the fight against constipation, it is worth taking advantage of the diet supplements market. Particularly slimming people should consider taking fiber in the form of dietary supplements (tablets or powder). When you take fiber in the supplement, be sure to remember about the proper hydration. Fiber binds liquids and if there is too little water in the digestive tract it will not be effective. Previous Post Protein supplements before or after training? Next Post The 5 biggest mistakes you make while cooking diet meals.